Atari 2600 was one of the first video-gaming consoles using changeable modules with games so-called cartridges. Until then, the majority of consoles was dedicated and have built in one or more games without replacement options. The console was constructed by Joe DeCuir and Jay Miner during 1976, who later worked on the development of 8-bit Atari computers. 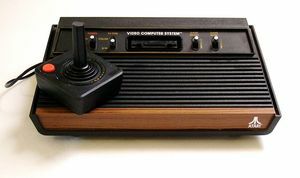 The console went on sale in 1977 under the name Atari VCS (Video Computer System). In the eighties, it was renamed to Atari 2600 and stayed on the market until the early nineties of the 20th century. Until today, the console still belongs to the best-selling video game systems ever. Its hardware was fairly simple. As the CPU, processor MOS 6507 from MOS Technology company was used. This processor is stripped-down version of the 6502. It had 128 bytes of RAM memory, which was integrated in the chip RIOT (MOS6532). 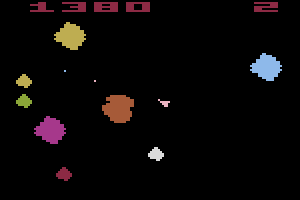 The graphics and sound were contolled by chip TIA. As a controller 8 directional digital joysticks with one trigger, paddle and trackball numeric keypad with 12 keys were used. The consoles were manufactured separately in version NTSC, PAL and SECAM. Games from individual regions were not compatible and if were used in the console from another region, the colors were displayed badly. Cartridges (modules) with games contained mostly ROM memory of 2 or 4 kilobytes. Later games were up to 32 kb in size. System of cartridges at the time was not encrypted, which allowed third companies to easily develop and sell their games. The most famous example of such producer was Activision company. Thanks to zero encryption, the library of games for the Atari 2600 has more than 1,000 titles. The initial price of game consoles in 1977 was set at 199 dollars and was supplied with two joysticks and game cartridges with Combat game. Almost immediately it noticed phenomenal success, and in 1979 these consoles were sold over a million copies, in 1980 two million and in 1982 even eight million. In 1985, an improved version of the console unofficially known as the Atari 2600 Jr. was released. This new variant was smaller and was sold for only $ 50. Its development was a result of the commercial failure of the Atari 5200 console (released in 1982), which should replace the popular 2600 version. Since today, Atari 2600 is for many people unforgettable symbol of its time. There are still a lot of fans producing new games, despite the fact that in 2007 the Atari 2600, celebrated his incredible 30th birthday. All information in this article are taken from the servers:	http://www.wikipedia.org/, http://www.root.cz/ and http://www.atariportal.cz/.